Nasa have just released a series of timely photos taken from their Lunar Reconnaissance Orbiter. This orbiter which is gearing up to map the surface of the moon to identify landing sites for future manned missions took some time to snap some images of the landing sites from the last visit we made to our pale dance partner in space. 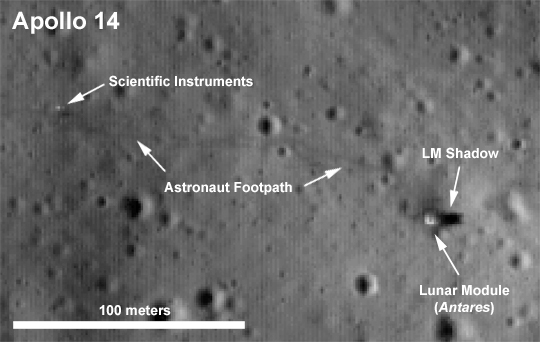 You can actually see the path that Al Shepard and Edgar Mitchell made as they shuffled from the Lunar Module to some of the scientific instruments. 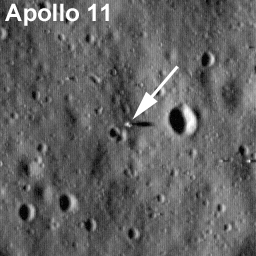 Apollo 14 is also my favorite mission for two reasons: as Al Shepard played some golf on the moon and the astronauts took with them a number of seed which where then germinated back on Earth to make Moon Trees (I am a big old sentimental softy at heart) . While its exciting to have these photos it does highlight a little how much of a shame it is that this is the first time we have seen the site of what is arguably one of humanities greatest accomplishments in over 38 years.